A humidifier is an indoor fan unit that circulates water vapor into the air. With humid air circulating through a room (especially a bedroom), your body can absorb some of that moisture into your skin, nasal passages and throat to keep you healthy and feeling great. Dry skin… sensitive skin… keratosis pilaris skin… eczema skin… All types of skin can benefit from added moisture. And an added bonus? No clogged pores. 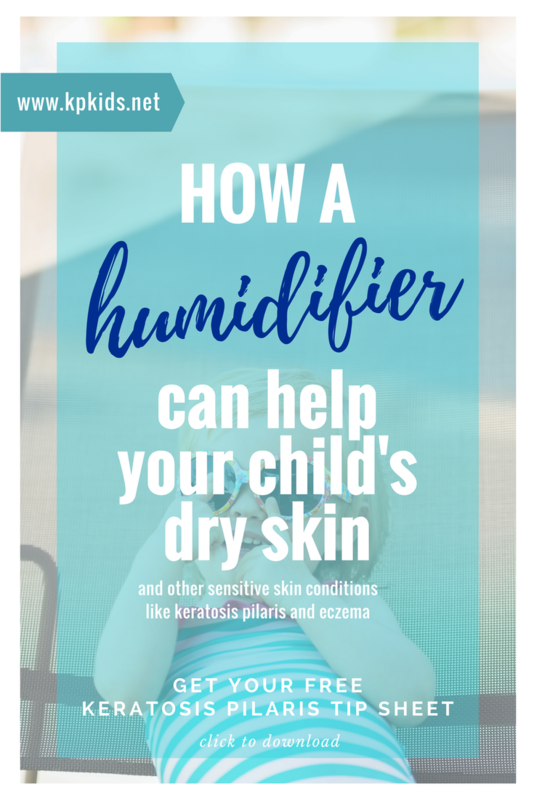 How can a humidifier help my child’s dry skin? Modern air conditioning and heating systems in homes are designed to produce drier air to keep our homes comfortable through the changing seasons. However, these systems remove some of the much-needed moisture in the air that dry, sensitive skin sufferers desperately need, including those with keratosis pilaris. Your skin is your body’s largest organ and it absorbs what’s in the air around it. By using a humidifier on a regular basis, you’ll likely notice that your skin will feel less dry and tight, less itching around irritated skin from keratosis pilaris or eczema, and less peeling from sensitive sunburned skin (always a plus). Your pores won’t get clogged and you’ll likely breathe easier. Which humidifier should I choose? Our top humidifier pick is the Honeywell Germ-Free Cool Mist Humidifier. With 3 settings to control the moisture output in the room, it’s an incredibly quiet humidifier (and we’ve had several loud ones in our arsenal) and ideal for use in a child’s bedroom while they sleep or nap. It can effectively cover any medium-size room, which is perfect for bedrooms with sleeping babies. The Honeywell Humidifier produces a soothing cool mist, meaning that the water vapor it puts out is cool to the skin and not heated or warm (like this best-selling warm mist model). If you’re using a humidifier in a child’s bedroom, especially younger children, opt for a cool mist humidifier to avoid any contact with a warm unit. This barely-noticeable mist in the air can help improve the feel of your skin by adding back in much-needed moisture, which is key to healthy skin. It has a large-capacity 2-gallon tank and once you’ve filled it with water, the humidifier can run for about 24 hours on the lowest setting (not that you’d need it on all day, but good to know). What makes this humidifier so great? One of the best features of this Honeywell Humidifier is that it uses UV technology to help kill up to 99.9% of any bacteria, mold and fungus that may be in the water. I don’t know about you, but I don’t want any mold or mildew collecting or growing in my humidifier, nor do I want it being circulated in the air I’m breathing. So for me, this UV technology is a HUGE plus. Clean air for the win. The Honeywell Humidifier is easy to clean with dishwasher-safe parts (another HUGE plus in my book) and antimicrobial replacement filters are available for about $8. After using our humidifier in our home for unusually dry seasons like Winter, we’ve come to appreciate how a little extra humidity in the air can really make our skin feel better. We’re noticing less itchiness from our extremely-sensitive skin son (11 yrs old) and his allergy congestion seems much-improved too. Humidifier – 1. Dry skin – 0. Do you use a humidifier in your home? How does it help your skin? To learn more about the Honeywell Germ-Free Cool Mist Humidifier (and check the reviews), click here.